David Bonney was in a bit of a creative rut. The London-based copywriter wasn’t searching for fulfillment, but a move to Berlin a few years ago provided a much-needed change of scenery and perspective shift. The transition also gave him the opportunity to pursue an enduring but as yet unfulfilled passion for footwear. “I’ve long held the desire to make a perfect shoe, and it’s actually this ambition that forced me to teach myself how to design,” Bonney tells Co.Design. “After years in advertising working with rather staid brands that didn’t really stand for much, I was tickled by the idea of creating a really purposeful brand–something I believed in. 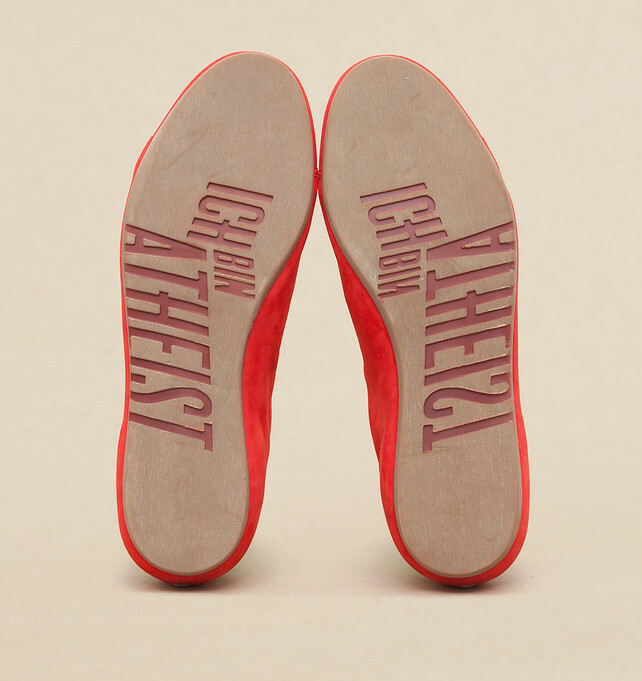 Which, ironically, is nothing.” And thus, the Atheist shoe was born. He teamed up with master shoemaker Jule Schümacher and spent a year experimenting in her studio before finally assembling a “decent” model by Christmas last year. And lest the admittedly unconventional thesis of the shoe give the impression that the collection is some kind of gimmick, it is, without a doubt, anything but. The pair considered a litany of thoughtful design details, and a set of limitations were established: The shoes would have an old-fashioned low profile, forgoing the cheaper route of vulcanized rubber for a far more careful (and time-consuming) bond that sees the sole sit beneath the upper; materials would be minimal–ultimately, the upper is constructed of three pieces of leather, with a lining of two–and visible seams would be limited, in order “to achieve a more perfect and unblemished whole on the outside.” Even the embossed writing on the soles is functional, providing necessary grip at key points where the foot touches the ground. Though in retrospect, he confesses he might have approached a different forum first, this rather roundabout introduction into apparel actually makes perfect sense. 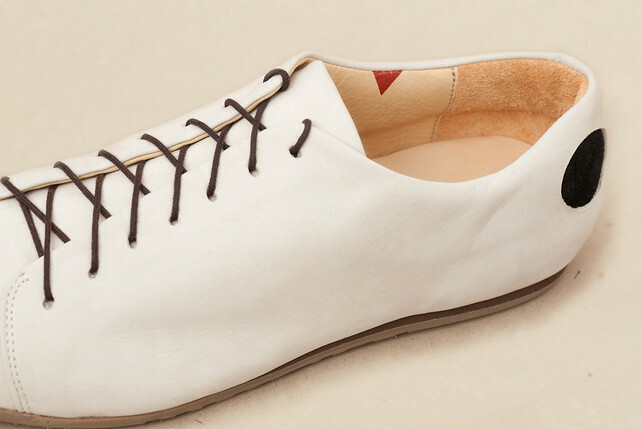 “Frankly, I don’t have a background in that world, and I hoped the concept behind the shoes and the simple minimalist design would be appealing to a large and diverse audience who don’t necessarily frequent fashion blogs and magazines,” he says. A wildly successful Kickstarter campaign quickly followed–which, like many wildly successful Kickstarter campaigns before it, came with its own unique set of complications. “Overnight I had to figure out how to make hundreds of shoes, when I had only ever made a handful before that point; it was a huge challenge, but we got there. I’m still amazed at how much we’ve achieved in the last year and how much my life has changed as a result,” he says. Now the company has about a dozen people “mucking in,” he says. “It’s a real hodgepodge of backgrounds–from shoemaking to sculpture, copywriting to book design, accountancy to film-making–not that any of them end up doing the things they’re trained to do.” Though the past few months have been “pretty mental” for Bonney and the business–sorting through the realities of manufacturing and sending wares all over the world–attentions are now being turned back to design, with plans for a high-top/boot style, a vegan version of the classic, and even a potential foray into clothing and accessories.